We all have a part of us that wants to go full office space after our jobs, that’s why Aggretusko is so easy to empathize with. Here to talk about our new Kidrobot x Aggresuko figures in normal and rage is our good friend Chris Holt aka The Toy Viking! 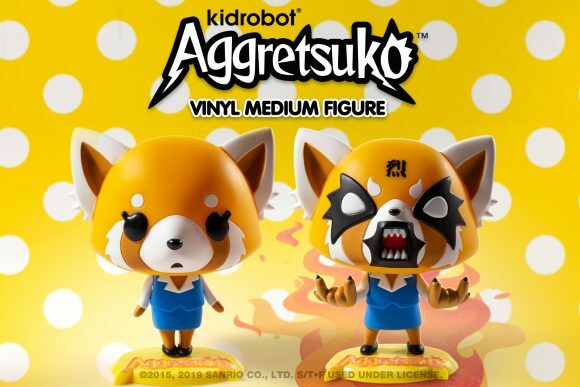 I could have never predicted that a red panda would suddenly be looked upon as my spirit animal, but Kidrobot has yet again changed my way of thinking because of a vinyl figure. I would have thought it would have been maybe a tiger, or one of those deadly little sand cats (look them up and be happy the rest of the day) but nope, it’s a death metal loving cartoon character created by Sanrio. restaurant there that is made to look like a prison, so belting out a few songs about dismemberment with inebriated businessmen isn’t that strange by comparison. Our little red panda friend isn’t angry all the time, which is why there are two versions of this vinyl figure to choose from. There’s the sweet, innocent, and beyond adorable one that is the picture of serenity. Then there’s the one that is super aggressive in a grab you by the soul rip it out and step on it in a pile of broken glass sort of way. Guess which one speaks to me the most? Both versions are available now at www.kidrobot.com.